About a month and a half ago I planned to build a Raspberry Pi controlled car. The idea was to control it through WiFi with live video feedback. Unfortunately the car won’t be built due to lack of money and time, etc. The live video feed takes about 30–50% the Pi’s CPU, depens on motion. High lag (up to 2 seconds). In sum, this guide shows how to control a DC and a servo motor with live video feedback, but the end result will be slow and imprecise. I planned to use two motors for the car, a DC motor for driving and a servo motor for steering. 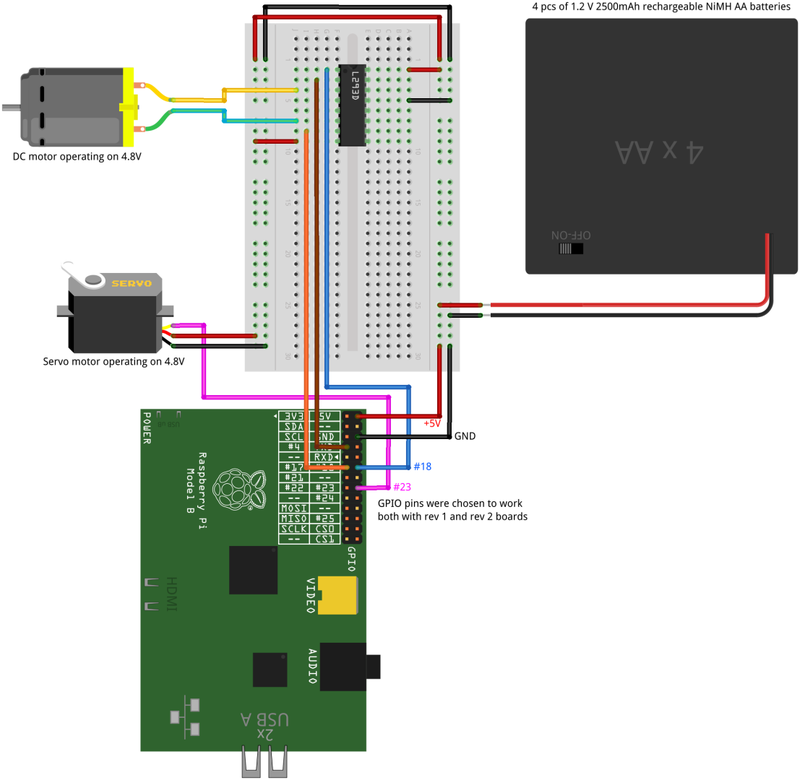 I followed The Adafruit Learning System’s guides for controlling a DC and a servo motors using the Raspberry Pi, so I won’t go into the details of the hardware setup and PWM signaling. I combined the circuit diagrams of the two guides into one using Fritzing. You can download the Fritzing format of the diagram, it’s included in the downloadable tarball (doc directory) towards the end of the post. The idea was to control the car through a simple webpage with embedded live video. This had set the course which led me to use the following software setup. Note: As for the OS I stayed with Raspbian, and since I didn’t have a camera board I used a webcam. First let’s install the necessary packages. Subversion will be needed to checkout MJPG-Streamer’s source from SourceForge, while ImageMagick and libjpeg8-dev are needed for building MJPG-Streamer. RPi.GPIO is a Python package which we’ll use to control the GPIO pins, and lighttpd will serve the web page to the client. Now we’ll checkout MJPG-Streamer’s source from SourceForge, enter the proper directory, modify the Makefile, and build MJPG-Streamer. If MJPG-Streamer was built successfully, edit your /etc/rc.local file. Add the following lines right before the exit 0 statement. This command will launch MJPG-Streamer at system startup. Make sure that lighttpd’s document root is the /var/www directory. Add the following lines to the end of the file. These will load the CGI module, create an error log at /var/log/lighttpd/breakage.log, run Python scripts with a “custom” binary, and map the /usr/lib/cgi-bin/ directory to the document root as cgi-bin/. Make lighttpd start on system startup, and restart lighttpd to use the updated configuration. I was using RPi.GPIO version 0.5.3a for controlling the GPIO pins and at the moment RPi.GPIO needs root permission to do this. So I needed to run the Python scripts as root, but since lighttpd can not be run as root – which would be a sechole – I needed to hack a little bit. I found the solution in Dav’s Raspberry Pi – Controlling GPIO from the Web post: I made a copy of Python’s executable and gave it the setuid attribute. Note: All Python scripts executed by lighttpd will now run as root. DO NOT USE THIS ON ANY PUBLIC SERVER AS THIS IS “A POTENTIALLY DANGEROUS TECHNIQUE”. You can download the GPIO control scripts and the client web site by either clicking the link below or typing the following command. Now all we have to do is to extract the archive, copy all the files to the proper places, and add some permissions. The client side uses jQuery, so you’ll have to download jQuery 2.0.2 minified and copy it to /var/www/js/, or use the following command. The final step is to download a HTML5 CSS reset and place it in /var/www with the name reset.css. If everything was setup correctly then all you have to do is to enter your Pi’s IP in your browser’s address bar, and you should see the webpage with the controls and the live video. You can either use the mouse or the keyboard to control the motors. If you use the mouse, then you can turn the servo by clicking on the left or right arrows (this will toggle the direction), and drive motor by holding down left click on the forwards or backwards arrow. When you use the keyboard you have to keep the arrow keys pressed to turn or drive the motors.